Smeg ovens are among the most stylish appliances available. If you want to make a statement in your kitchen, choose a great looking Smeg oven from our range of ovens. A Smeg oven will complement any kitchen, but just because they look good, it doesn’t mean you’ll be compromising on performance. Cooking meals for yourself or your family will be a pleasure, and because they come in a range of sizes and styles you’re bound to find one you love. 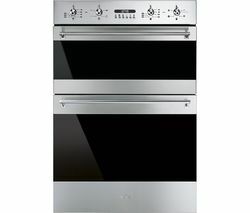 Smeg ovens are available in a number of classy finishes including black, cream, stainless steel and silver & glass. With its 72-litre capacity, even huge roast dinners won’t be a problem when you choose the Linea SFP109 from Smeg. Cooking is even easier with this oven, as you’ll be able to cook the whole meal from your starter to the dessert with it. 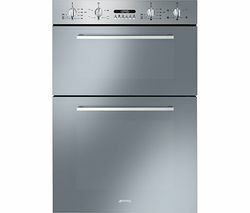 If you’re looking for an affordable oven that’s just as reliable as a Smeg oven, take a look at our complete range of Bosch ovens and if you don’t see anything that takes you fancy there, don’t forget to check out all our AEG ovens. When you want to get creative in the kitchen, a Smeg oven is ideal.